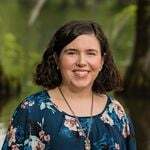 Today, we have a guest blog post from mommy blogger Bethany from “I was promised more naps…”. When you’re searching for a Wilmington area home to buy, don’t feel confined to room labels. Just because a description calls a room a dining room, living room, etc., doesn’t mean it needs to be used for just that. 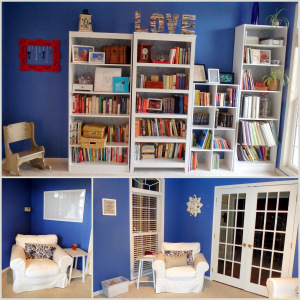 Here’s how Bethany repurposed her formal living room into the perfect library for her family. When my husband and I bought our house in 2012, we were faced with an “extra” room that we weren’t quite sure what to do with. In addition to a large family room where we planned to put our living room furniture and TV, there was a smaller formal living room/den right by the front door. We briefly considered making it a playroom for our son, but because it’s the first thing people see when they come into our house, we didn’t want to have to worry about constantly keeping it tidy. After some deliberation, we decided that we would make it into a cozy library and reading room. I’m constantly on the lookout for new decorations for what is now my favorite room in our house, but here are a few of the ideas I’ve used to decorate our home library so that it’s a functional and attractive addition to our house. – Stick with one neutral and one or two colors for furniture, walls, and accents like picture frames. Books tend to come in a lot of colors, so keeping the rest of the colors simple will prevent the room from looking too busy. 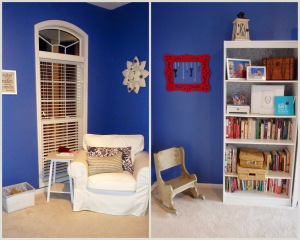 For our library, I chose blue for the walls and throw pillows, white for the picture frames and furniture, and a pop of red for one decorative frame. (The white covers on the chairs are machine washable, so I don’t have to worry about letting kids sit on them.) We also covered the backs of the bookshelves with a white and blue wallpaper to add some extra color. – Encourage people to stay and read with comfy chairs and good lighting. Our library has two large windows and a bright overhead light. If your room isn’t well lit, consider adding lamps next to your chairs. 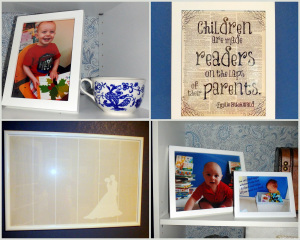 – Decorate with pictures of your family reading and book-themed art. One of my favorite things in our library is a framed poster that features the entire text of Pride and Prejudice. – If you have children (or if kids visit frequently,) make the room kid-friendly by putting children’s books on lower shelves or in baskets. For my two-year-old son and our younger guests, we have a basket of board books on the floor. For our friends’ older children, we have four low shelves of kids books. 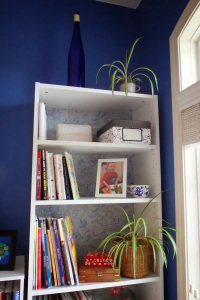 – Place decorative items (such as boxes, jars, plants and figurines) on the shelves with the books. This will give your library a more personal feel, allow you to add your own style, and let you show off items that are meaningful to you. Leave a Comment Below: What other ideas do you have for alternate uses for a formal living room?